A week ago this day they gathered, as they've done on the same date each passing year of the cataclysm, to mourn what was so utterly avoidable. The lonely tombstone on an Oakland hillside stands watch over the 400 murder victims resting in the mass grave. For too many years, it has been essentially ignored by the Big Media. This year appears to be little different than most of the rest. Many, if not most, of those in this mass grave are the children and babies slaughtered in one of the worst cult crimes in history. But on this, the 29th anniversary, a dramatic difference unfolded. Members of a group calling themselves the Guyana Memorial Wall Project were holding a ceremony, in which they did more than light a candle for each of the children and read off their names. They announced, at long last, that a memorial wall--featuring a special dedication written by famed poet Maya Angelou--is finally going up in Evergreen Cemetery. The project's executive director, Jynana Norwood, suffered the unspeakable loss of 27of her closest relatives, including her mother. “Our wall is in the spirit of others whose lives were lost due to hate or ignorance," said Norwood, citing the Jewish Holocaust, African slave trade, Vietnam War, and other modern-day tragedies. What, readers? You mean you DIDN'T HEAR A WORD OF COVERAGE about this event last week?? Oh, well, a few of you were lucky enough to catch one of the two local TV news broadcasts, or even unearth this story from an online edition of the Black newspaper, New Pittsburgh Courier. But for the vast public they supposedly are to keep informed, our Big Media once again has deliberately fumbled the ball. Just as they did in prostrating themselves before Jim Jones in the 60's and early 70's, until those publishers and editors regrew their backbones, and exposed his destructive cult--too little, too late. Yes, they'll likely oblige a bit of perfunctory coverage on next year's magic number 30 anniversary of the Jonestown massacre, especially if this wall is finished and officially dedicated. But don't expect the New York Times, Washington Post, San Francisco Chronicle, Los Angeles Times, or any of the broadcast networks to give you any thing different than the same old fabricated slop they claim was the Rise and Fall of People's Temple. Especially now that they've championed Director Stanley Nelson's cinematic apologia that impresses viewers with all the "good things" about that cult nightmare, that none of us really could fully appreciate until Stan's editing wizardry was showcased. Nelson, like the reckless, irresponsible media directors that ushered into power Miracle Man Jim Jones, has been gullible enough to swallow all the fairy tales from cult-friendly sources. His primary fountain of disinformation is Rebecca Moore, head of the "Jonestown Institute," who does a magnificent job of fusing truth and fiction when doling out "the facts" about People's Temple, Jonestown, and cults in general. But the "C" word is absolutely verboten around Becky; no, cults--even the most destructive--must be dolled up in palatable terms: "New Religious Movements". But let's not give Prof. Moore ALL the credit. She's got lots of friends, such as her two equally flaming cult apologists, Douglas Cowan and Catherine Wessinger. The three of them produce "Nova Religio," a Univ. of California Press journal purporting to give "scholarly interpretations and examinations of alternative religious movements." Certainly. "Scholarly interpretations" much like those planted throughout Moore's (and husband "Mac" McGehee) website, such as the statement about "mixed reports" on conditions at the Guyana Gulag. "Work was hard, and as Jones seemed to grow more paranoid, never-ending," she concedes in her FAQ section. Then Moore tosses in this clever little canard: "...At the same time, however, audiotapes the community made of its own meetings reveal a sense of camaraderie, laughter, good times, and high purpose." A "sense" of "good times"? It's a shame that film maker Nelson was too lazy to consult with some ethical, genuine expert sources on cult social psychological dynamics, especially after Moore spoon fed him all this hogwash. On a wider scale, we see this behavior in the success of cults. 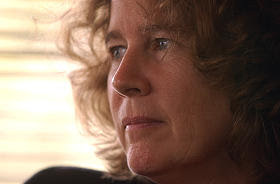 On the other hand, cutting off a person from the outside world, constantly and repetitively indoctrinating them, and accompanying this with threats of social group disapproval on the one hand, and loving acceptance based upon obedience, on the other, can drastically change a person’s behavior changed in a chillingly short period of time." And if simple mind-control didn't complete the enslavement of those at Jonestown, besides the menacing armed guards, "Dad" Jim employed drugs to ensure the continuation what Becky Moore points to as not only "good times", but a "high purpose." "If a person wanted to leave Jonestown or if there was a breach of rules, one was taken to the extended-care unit," he explained. "It was a rehabilitation place, where one would be re-integrated back into the community. The people were given drugs to keep them under control." After a few days or weeks, Parks said, the patients lost their desire to leave the commune and no further behavioral problems were anticipated. Asked about the use of drugs for brainwashing, Parks said, "It is a reasonable assumption that such went on in the extended-care unit." The following are examples from a partial inventory that has been independently authenticated by law enforcement sources. 1. Thorazine (chlorpromazine), 10,000 injectable doses and 1,000 tablets in a size normally given only "for severe neuropsychiatric conditions." The drug acts "at all levels of the central nervous system." It is effective for the "management of the manifestations of psychotic disorders" and for control of the manic depressive. 2. Quaaludes, 1,000 doses of the sedative-hypnotic drug frequently used in suicide attempts. 3. Vistaril, 1,000 doses. Used for total management of anxiety, tension and psycho motor agitation; can render the disturbed patient more amenable to psychotherapy in long-term treatment of neurotics and psychotics. 4. Noludar, 1,000 pills. A sleeping aid that produces both physiological and psychological dependence. Moderate overdoses can produce delirium and confusion; large overdoses, stupor leading to coma. 5. Valium injectable, 3,000 doses. Useful in treating neurotic states manifested by tension, anxiety, apprehension, fatigue, depressive symptoms or agitation. 6. Valium tablets, 2,000. An overdose of Valium in either form tends to make suicidal patients more likely to make a death attempt. 7. Morphine sulphate, injectable, 200 vials. This strong pain killer can be habit-forming and have complex psychological effects. 8. Demerol, 20,000 doses. A narcotic analgesic, it should be used with great caution and has multiple reactions similar to those of morphine. 9. Talwin, 1,150 doses. Similar to Demerol in morphine-like actions. The drug has a history of creating psychological and physical dependence. 10. Seconal, 1,000 pills. An extremely dangerous sedative and hypnotic that can be habit-forming. Must be used under medical supervision. So, if a week-long stint in one of the cult's wooden "punishment boxes" (where children were sent, as well) didn't produce a "good times were had by all" attitude, then forcing a cultist to get wasted on multiple hits of Demerol or Quaaludes surely would. What is so absolutely reprehensible is that anyone would seriously promote the "positive" sides of the People's Temple, be it the cult's California years or its hellish final phase in Guyana. For Becky Moore, and for that matter, her disgraceful father, Rev. John Moore, maintaining this charade is obviously their way of coping with two family members--Carolyn and Annie--that were cult enforcers and, in the end, executioners of the children that lie under that tombstone today in Evergreen Cemetery. Jynana Norwood had the courage and wisdom to resist the cult, and at least rescue her son, instead of degenerating into a Temple apologist and pathological liar. She might consider, however, before handing out educational grants from the Guyana Memorial Project, that all recipients have in their required courseload, a class that will teach all the danger signs of destructive cults. Confronting the Cult Apologist Plague on the College Campus. No a word! Not one damned word in Mendocino County! Robin, of course not one damned word in Mendocino County, where the Temple cult madness had kicked into overdrive before its turbo-charge into the left-wing embrace of San Francisco. A couple of years ago I did get something of a public apology--a great rarity--from the current publisher of the Ukiah Daily Journal, for their newspaper's appalling collusion with Jim Jones. Not that they were the only ones, of course. 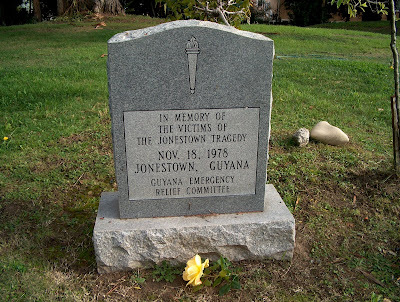 Nevertheless, their silence on this latest anniversary continues to speak the proverbial volumes of guilt for their paper, along with the rest of the shameless media, religious, and political wretches that helped Jim Jones put those childen and babies in that lonely grave in Evergreen Cemetery. None. I'm in Michigan and on the segment This Day in History on the History Channel, NO MENTION OF IT for November 18th. No word in Humboldt County either. Except on the blogs - yours and mine. Next year will be a different story.